We Want Bonaire Back (NKBB) congratulates the peoples of Bonaire for their unprecedented act of courage and resistance of massively protesting and boycotting the march 20, 2019 cover-up elections organized by the Dutch government in a desperate action to legitimize the Dutch colonial status imposed on October 10, 2010. As all politics-analysts are analyzing the results, NKBB determine that the referendum 2015 base of 5040 No-votes remained steady and grew further. 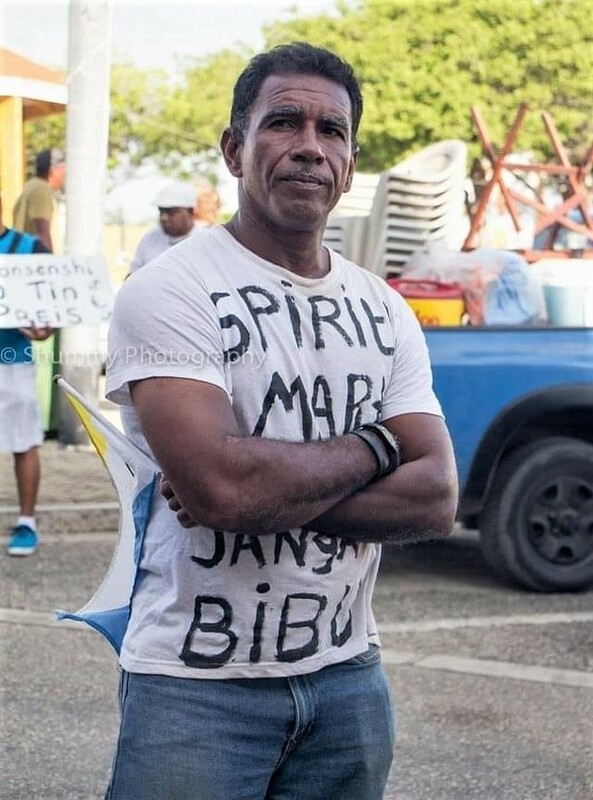 The 2019 elections results shows; 5269 no-voters and 215 blank and invalid votes and the pro-Bonaire parties (EN-UPP-FSP-URB) 1284 votes totaling 6768 voters remained unhappy and protested against the current colonial status. And we still have to add to count to this amount all the citizens that in the election, voted out of tradition, emotion, loyalty, etc. to their PDB and UPB leaders and candidates but are against this system, and wants Bonaire back, and voted No in the referendum of 2015. NKBB called to the people to either don’t vote or vote blank as protest, don’t fall in the Dutch democratic trap and to protect the results of the massive rejection of the current status in the 2015 referendum. Don’t vote to continue to show the dissatisfaction against the illegal annexation and embedding of the territory and the peoples of Bonaire in the Dutch constitution without equal rights and under Dutch colonial rule from The Hague. The protest-vote was simultaneously an act of solidarity with the peoples of our sister island Sint Eustatius where the Dutch government through undemocratic abusive actions deposed the legitimate elected government and deprived the citizens of St Eustatius of their democratic human rights by blocking the scheduled free election. The political party MPB which campaigned extensively and publicly in 2015 referendum for the Yes-vote and lost the referendum with 2649 yes-votes, grew with 927 votes in this election more merely of Dutch-European immigrants, who voted to maintain the current status won the 2019 elections but will remain to be against the people of Bonaire which rejected this structure in the 2015 referendum. This result is evident as since 2015 the population keep on growing at rate of immigration over 400% with mostly immigrating Dutch-Europeans with the right to vote after 90 days residing on Bonaire. The cruel reality is the fact that Bonerians are displaced and facing an inevitable ethnic cleansing process are reduced to the minority on our own island. A revolution was initiated with NKBB call to boycott and protest against this political system that is illegal and a clear colonial structure got the whole local island leadership which still believes in this system where they have no-power and the Dutch government in the Hague governs and decides, were challenged in their core beliefs, stood up against NKBB. The Dutch propaganda machine mobilized intensively to counter the possibility of the peoples protesting and not voting. All media outlets were flooded, thousands were spent by the Dutch-government to promote go-vote. The “RijksDienst Caribbean Netherlands” (RCN) the Chamber of Commerce, the elite and service group’s leadership united, the Dutch press/ media conspired and intimidated the local press to boycott and stop NKBB from exposure in the Dutch and local press, innocent popular Bonaire icons where miss-used to promote go-vote etc. The governor Mr Rijna, not-elected and appointed to represent the King and the Kingdom interests, was used as some kind of main mascot, almost every day in the media, to call on the people to make use of their sacred-right to go-vote. Hypocrisy at its highest to oblige the people to go-vote and legalize a system that has shattered and violated all their sacred fundamental human, democratic and self-determination rights. On election-day as never before in our history, an all day-long all media campaign, also from our sister islands, headed by the governor to call on the people to go vote. And despite all this propaganda to promote a non-existent fake-democracy, voting in a Dutch ruled colony, the people of Bonaire stood strong and showed that they will fight to the end for their island and defeated all powers of manipulation. All prior elections the turnout was over 80%, now fell to about ca 60% and deducting all the Dutch-Europeans and immigrant loyalists and mercenaries we can safely establish that the turnout is under 50%. With this result the people of Bonaire has rescued and re-established their dignity. The hope is alive and regained new strength and we are urging the people to come together and support NKBB trajectory to re-list Bonaire back on the Non Self Governing Territories’ list of the United Nations to get the international community involved to help us get our rights, and to be as free and as equal as all Dutch-Europeans.